These alleys were the playground of my early childhood. Back in the late 1960s while living on the north end of 14th street in Bellingham, Washington, I would adventure with my friends up and down these little-traveled roads, crawl through the jungles bordering the houses, and treasure hunt in the giant hedges lining the back yard of the neighbors’ house. I walked to school, Lowell Elementary, meeting friends (sometimes enemies!) through the rain and the, seemingly more common then, snow. It’s been years now since I lived in that neighborhood, many more since I explored in those alleys. On a very hot day in the summer of 2014, feeling a need to walk and sweat out some thoughts, I found myself climbing the steep hill leading to the north end of the 14th/15th street alley. Something about the harsh noon-day sun, the contrast of shadows and sparkling leaves of ivy and maples trees that march and weave alongside this path made me start to photograph as I walked along. Maybe an attempt to catch the memories that were fleeting through my mind, attempt to see through the sun and shadow to those distant times, those now far away tree houses and forts. Many aspects of these alleys have passed on, leaving strangely open spaces, new homes and garages. And yet, here and there, echoes of that past still rippled through the sunlight, shimmering with the heat of the afternoon. A stairway, a line of telephone poles, an open garage with missing windows appearing as eyes all witnessed me journey through my past. For days I returned to this alley and the one above it, between 15th and 16th streets, walking and photographing whatever caught in my thoughts. 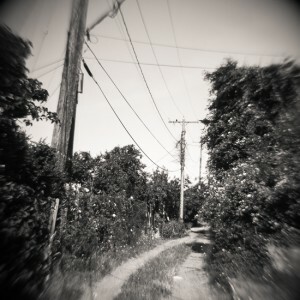 Looking through my camera using a Kern-Palliard 25mm cinema lens, added to this sense of time travel. The lens was made around the same time that I played in these alleys, in the 60s, and its edge distortion, its blurring which causes a sense of movement, and its sometimes lack of clarity yet spots of sharpness reflected the sense of memory I was experiencing on these walks. 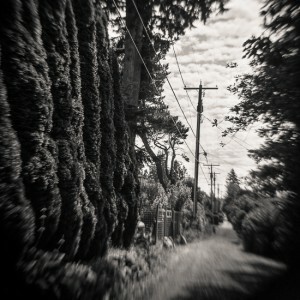 The images in this gallery represent a selection of the photos created during my walk through the alleys of my childhood.